New World Library, 9781608686032, 256pp. Like yoga before it, mindfulness is now flourishing in every sector of society. It is a buzzword in everything from medicine to the military. 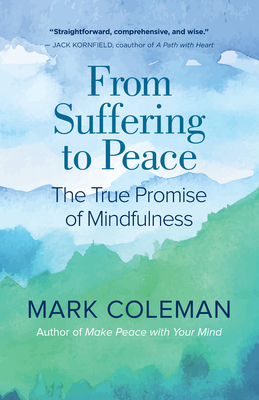 Mark Coleman, who has studied and taught mindfulness meditation for decades, draws on his knowledge to not only clarify what mindfulness truly means but also reveal the depth and potential of this ancient discipline. Weaving together contemporary applications with practices in use for millennia, his approach empowers us to engage with and transform the inevitable stress and pain of life, so we can discover genuine peace -- in the body, heart, mind, and wider world. While profound and multilayered, the mindfulness teachings Coleman shares have proved effective in a wide variety of settings. From Suffering to Peace will help readers of all kinds access and benefit from the "true promise of mindfulness. Mark Coleman has taught mindfulness meditation retreats and trainings worldwide for twenty years. He is the founder of the Mindfulness Training Institute and Awake in the Wild programs. A senior teacher at Spirit Rock Meditation Center, he lives in Northern California.